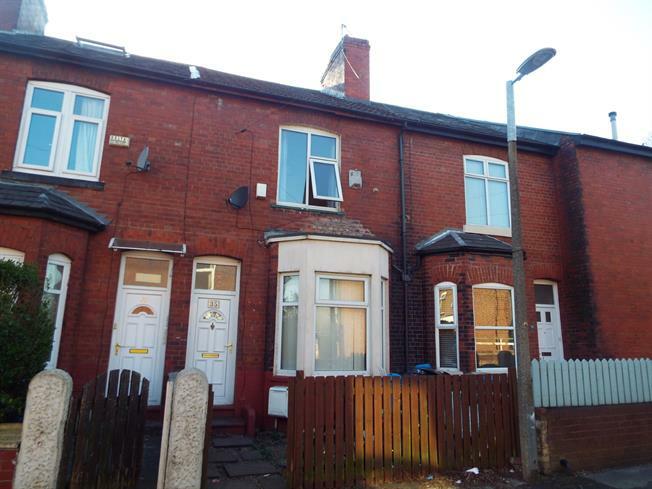 6 Bedroom Terraced House For Sale in Salford for Offers Over £220,000. This spacious period terraced property offers six double lettable rooms and is spread over four floors. From the entrance hall is a front reception room currently used as a bedroom, a well presented dining room with patio doors to the rear garden, modern fitted kitchen and access to the converted cellar featuring a further double bedroom. To the first floor are two double bedrooms a communal bathroom and separate WC. There are a further two double bedrooms to the second floor. Well presented throughout and in a popular student location, this is an ideal investment opportunity! UPVC front double glazed door. Radiator, laminate flooring, original coving. Double bedroom; double glazed uPVC bay window facing the front. Radiator, laminate flooring, original coving. UPVC French double glazed door, opening onto the yard. Radiator, laminate flooring, built-in storage cupboard, original coving. Access to the converted cellar. Double aspect double glazed uPVC windows facing the rear and side overlooking the yard. Vinyl flooring, boiler, tiled walls. Granite effect work surface, wall and base units, one and a half bowl sink with mixer tap and drainer, integrated electric oven, integrated gas hob, stainless steel extractor, space for washing machine and fridge/freezer. Laminate, tiled and carpeted flooring. Double glazed uPVC window with obscure glass facing the rear. Radiator, vinyl flooring, tiled walls. Low level WC, corner shower, pedestal sink, extractor fan. Tiled flooring, tiled walls. Low level WC.